Theresa May went to Brussels and negotiated a deal which would leave us in most parts of the single market and the customs union until at least 2022. And it’s up to the EU as to when we can leave the customs union & single market. From there, we could negotiate free trade deals with countries such as the United States, China, South Korea, Japan and the rest of the Commonwealth. After we voted to leave, countries were preparing to sign trade deals with the UK. The world would be our oyster. The Wetherspoons boss is even going on a tour of the UK promoting a no-deal Brexit. Wetherspoons is one of the biggest restaurants in the UK, and their boss saying a no-deal Brexit would be best surely means it would be good for most businesses. 200 major business leaders have also signed a letter saying that a no-deal Brexit would be best for them. The Irish government and the EU have both made absolutely clear that there won't be a hard border between the Republic of Ireland and Northern Ireland, even if there's no deal. And if you want to read the news article that says this, then here is the news article. Although Theresa May says that freedom of movement will end under this deal, if you read the legal print, it just says that both sides are “dedicated” to the end of freedom of movement. (This didn’t appear in the first draft, but was updated a few days ago to reflect this.) This doesn’t necessarily mean freedom of movement will be ended, just that they are “dedicated” to end it. I’ve already said that we’re remaining in the Customs Union and Single Market. Although the government says we will be leaving both in 2022, the legal print says that the transition period can be extended, “if needed”, until “20XX” This means the transition period could end in 2022 or in 2099. I don’t want either. This deal that Theresa May has managed to negotiate doesn’t deliver on any of these points. OK, maybe the £350 million a week figure was unrealistic, but the point was we would save a large amount of money. And with a no-deal, how much would we save? I want to find out that answer. Brexit was the biggest democratic decision we had made in history. Yet those who are leading us don’t believe in Brexit, so why should we believe in them? Up until a few days ago, I thought that it was only recently when Theresa May decided she wanted this deal. But she then admitted that this was the deal she had wanted all along, even when she said very clearly that we would be leaving the single market and customs union. When I heard that, I thought it sounded like the last chapter of Animal Farm by George Orwell, when the pigs openly admit, without any criticism, that some animals are more equal than others. If any person who is high up in the government is reading this, I just want to say one thing. Why? Why did you let this happen? Why did you let her negotiate this deal, despite knowing that it doesn’t deliver on the referendum result? Today (25th November) is the day that the deal gets officially signed off by the EU. Thankfully, there are things you can do to make sure there is a no-deal Brexit (or a Canada-style free trade deal with the EU). The EU have said that they won’t renegotiate, so a no-deal is the only other option that genuinely delivers on the referendum result and what the people voted for. Parliament are expected to vote on this deal in early December. It looks like that MPs, both Remainers and Leavers, will vote the deal down in Parliament – and rightly so. (Although the reasons why they are voting against the deal are different. Most of them don’t believe that the deal is what we voted for.) What is expected to happen is if (hopefully when) she loses this vote, there will be a no-deal, no Brexit, a second referendum or a general election. Nobody would vote Conservative, if at all, ever again. We would be like America where 100 million people who are eligible to vote don’t. It would stifle faith in democracy. We voted to leave the European Union, so let’s make sure it gets done. That would definitely be the end of Theresa May’s and most MP’s careers. This point is pretty self-explanatory. Some people, mostly remainers, want another referendum, also known as a People’s Vote. Many high-profile remainers, including Harry Potter author JK Rowling, have supported this idea. 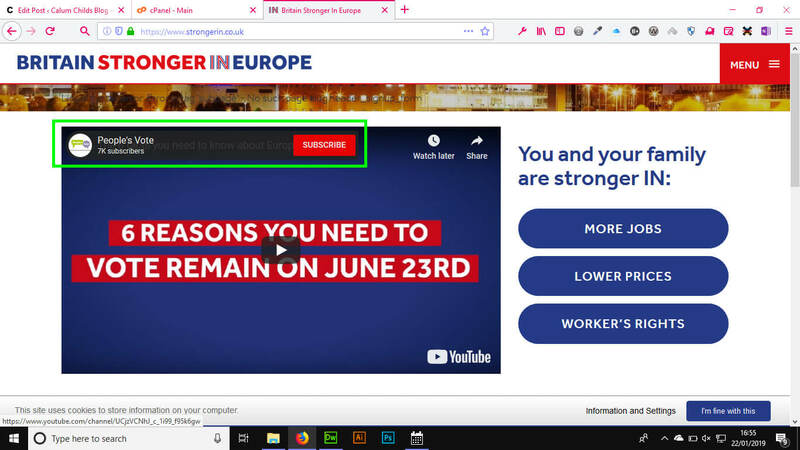 Their official website says that they want a vote on the final deal. However, some who support this idea want a Remain option to be on the ballot paper as well. I wouldn’t mind if the options on the ballot paper were Theresa May’s deal or no-deal, but that would mean the uncertainty would have to be extended. Personally, I don’t want a second referendum: we had a People’s Vote back in 2016! Like the second referendum idea, we don’t have time to have another general election. Because of the terrible leadership Theresa May has been leading under, Labour would get in and, if they stuck to their 2017 manifesto, we would still remain in the single market, customs union and many other European projects. The same goes for the Liberal Democrats. No major party apart from the Conservatives clearly mentions that should they be in power, we would be leaving the single market and customs union. To sum this up, a no-deal Brexit would not be the apocalypse some people are predicting. If we left with no deal on 29th March 2019, then we’d be just like any other non-EU country in the world. We would trade under WTO (World Trade Organisation) rules, which, unlike May’s deal, we would actually have a say upon. Many Brexiteers say that May’s deal is worse than staying in the EU as we’d still be following the same rules but without any say in them. “As we leave the European Union, we will no longer be members of the single market or customs union but we will seek a deep and special partnership including a comprehensive free trade and customs agreement. There may be specific European programmes in which we might want to participate and if so, it will be reasonable that we make a contribution. We will determine a fair settlement of the UK’s rights and obligations as a departing member state, in accordance with the law and in the spirit of the UK’s continuing partnership with the EU. The principle, however, is clear: the days of Britain making vast annual contributions to the European Union will end. Many people (including me) have explained May’s Brexit deal in one or two sentences. It's like paying a plasterer – who you've never heard of before – in one payment before he's even started the job! It's ridiculous! Edit – 22/01/2019 : If you want to see the a list of some of the business leaders backing Brexit, click here.